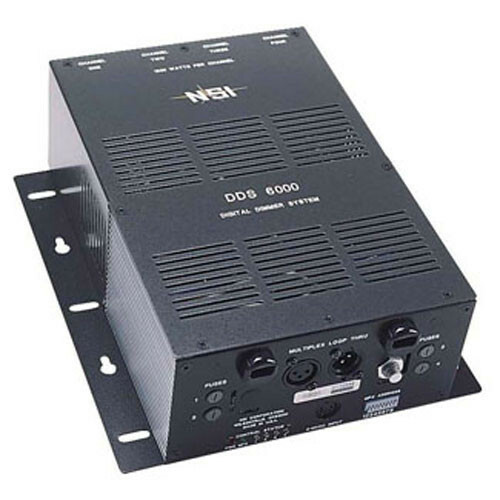 The DDS6000 has four channels and a grounded Edison 120VAC mains power cable. Plug in single or ganged lights, up to 1200 watts on each channel, up to 1800 Watts total. Its circuit breakers are external on the front panel. Box Dimensions (LxWxH) 13.2 x 11.5 x 9.2"
DDS6000 Dimmer, Relay System - Four Channels, (120VAC/15A) is rated 5.0 out of 5 by 1. Rated 5 out of 5 by Peter from Simple 4 Channel DMX Dimmer Pack Exactly as expected, a simple 4 channel DMX based dimmer pack. The device works exactly as spec'd. There is only minor annoyance -- it is possible to switch each channel individually between a standard dimmer mode and a relay (on/off) equivalent mode, but you must open the case to access a set of internal DIP switches to change modes -- a rather inconvenient process compared to the externally mounted DIP switches for the DMX address. Aside from that, everything works perfectly.